Djurgården is an island in the center of Stockholm. It is a paradise for walking. You will see lots of tourists but also people who live in Stockholm. 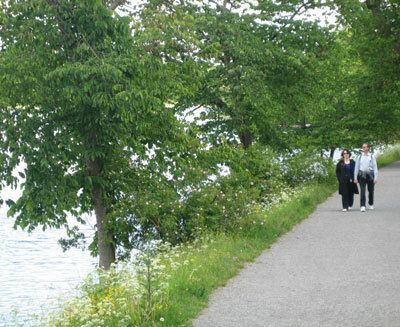 Djurgården offers a beautiful nature and almost all over the island there are nice walking-paths along the water. 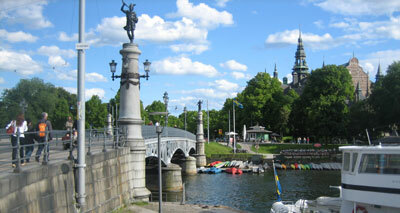 Our walk starts at Djurgårdsbron, the bridge that takes you to Djurgården from Strandvägen. There are many alternatives for getting to Djurgården. Since it is close to the center you can walk there in half an hour from Sergels Torg. But you can also go by bus 47, by boat from Slussen or Nybroplan or by tram from Norrmalmstorg. Our walk starts at Djurgårdsbron, the bridge that takes you to Djurgården from Strandvägen (yellow circle) and goes all the way to Waldemarsudde (blue circle). When you have crossed the bridge you turn left along the water. The walk takes about 2 hours, but you will sure want to spend more time in making nice stops during the walk. We want you to discover your own favourites, but we want to give you some ideas about the walk - things that we appreciate a lot. 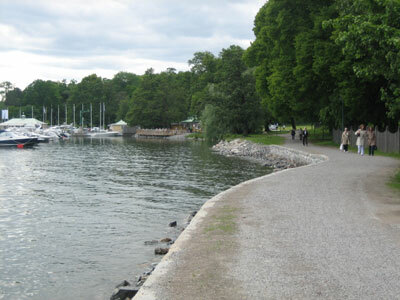 Right in the beginning of your walk you will pass Skansen, where you can easily spend a whole day. 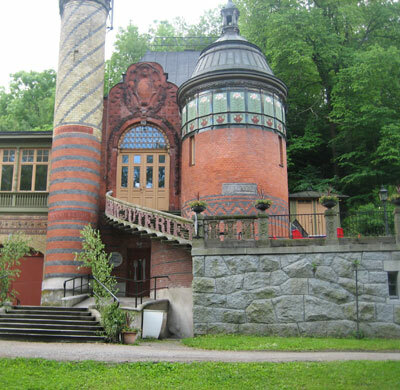 We recommend you to come back later for visiting this open-air museum and Stockholm Zoo. Maybe you would like to have a cup of coffee right in the beginning of the walk. There is a nice café on your right hand after only a few hundred meters. The name is "Systrarna Helin Voltaire" (The sisters Helin Votaire) and you can see it on the photo below. The cakes are homemade och you can sit inside the cellar vault or outside in the garden. 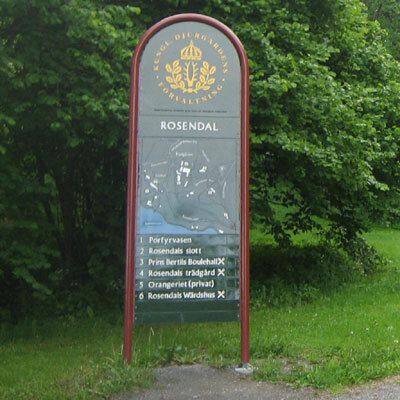 A little bit further on you can, if you like, make a detour to Rosendals trädgård (the garden of Rosendal). See the sign. The walk continues along Djurgårdsbrunnsviken. If it's a nice day you will meet many people. After about one hour's walk you will come to Blockhusudden. Here you will find the nice cafe "Blockhusporten", where you can have Italian ice cream or coffee. It is possible to sit indoors and in the beautiful garden, both with a great view over the water. Now you reach the south side of Djurgården. 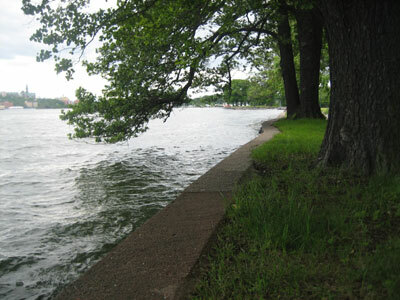 On the opposite side of the water you will see Nacka Strand and Södermalm. After about half an hour you will pass Biskopsudden. 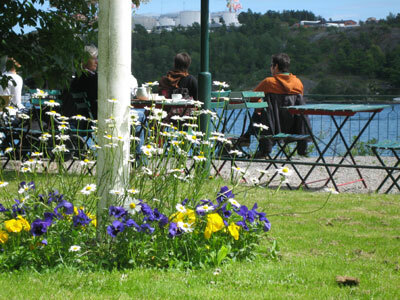 It is nice to have a stop at the café Ekorren or the restaurant Lisapåudden, both by the water. In several places along the way you also find tables where you can. 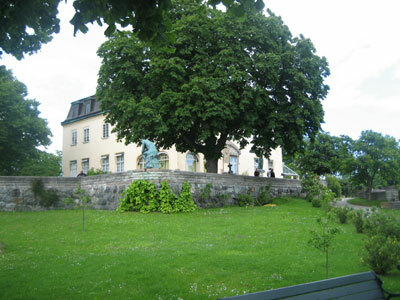 Our walk ends at Waldermarsudde which is one of Sweden's most visited art museums. 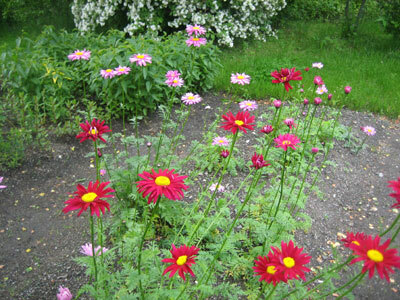 Waldermarsudde also offers a garden with flowers and sculptures. It is a beautiful garden for walking. At Waldemarsudde our walk ends. We hope that we have been able to give you some inspiration so you can make your own walk with your own discoveries. From Waldemarsudde it is possible to take the tram or bus 47 ou from Djurgården to the center of Stockholm. 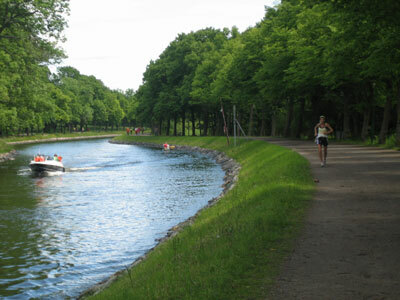 It is also possible to walk back to Djurgårdsbron. You will then pass Gröna Lund and Skansen. Below you can see all our walks in Stockholm. The walks are warmly recommended for tourists and for people who live nearby.